Using the soil test report that I got a couple of weeks ago I amended and tilled my soil. Getting the soil balanced with all of the nutrients the plant will need is very important. The most important things you do in your pumpkin patch to grow a giant are done before you even put your plant in the ground. 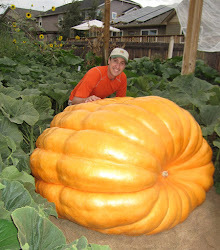 If the soil has poor tilth, compacted or missing nutrients then there is little to no chance of getting a pumpkin over 1,000 lbs at the end of the season. One thing you don't want to do is over do it for the amendments. You have to consider all sources when amending. For example, maple leaves can have a lot of calcium in them. If you till in a bunch of leaves in the fall, but your soil already had adequate calcium, you could end up with too much calcium in the soil. Calcium can be antagonistic to the uptake of potassium and typically there is a lot of potassium in a pumpkin so the end result is a smaller pumpkin. Know what is in everything you amend with and you should be in good shape. The following are what I amended my soil with yesterday. For some amendments, I put down about 70% of what the soil needs, because things like nitrogen can leach out of the soil over time, so I'll add the last 30% in smaller divided doses starting in two months or so. Other amendments like manganese and phosphorous aren't mobile in the soil, so I needed them fully added now, because if you put them on the top of the soil they won't move down through the soil to get to the roots very well. When I tilled in the soil it also tilled in the cover crop of winter rye that I had planted in the fall. That will help add organic matter to the soil (a green manure).